The Flat Optix™ micro-prismatic lens is designed to the European EN12464 glare standard for office and task lighting. 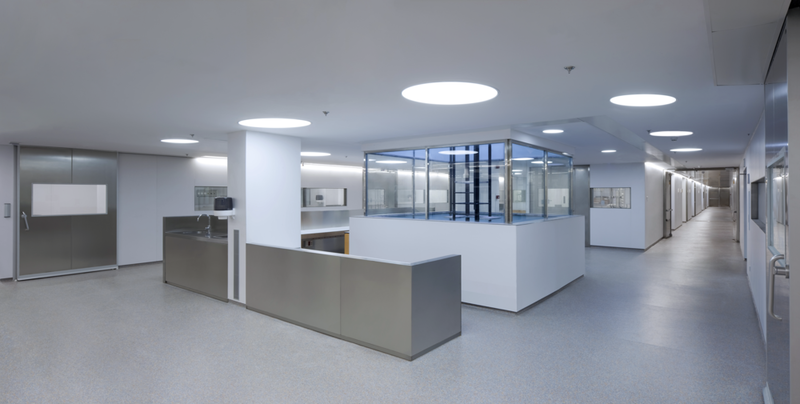 Providing uniform, well-balanced illumination, Flat Optix™ also delivers unmatched energy savings by only illuminating key task areas. Promoting well-being and contributing to high-productivity, Flat Optix™ is at the forefront of practical and well-designed glare control solutions being introduced to the lighting industry. Designed to deliver an unprecedented blend of form and functionality, Flat Optix™ luminaires pair a sleek and modern aesthetic with thoughtfully-crafted features that provide comfortable illumination to interior spaces. The unique Flat Optix™ micro-prismatic lens illuminates key task areas while directing light away from occupants’ eyes, enabling luminaires to provide high efficacy illumination without creating uncomfortable glare. Featured in the above image is the Skyler™, the industry’s first edge lit volumetric luminaire. Skyler™ provides glare free lighting without the caving effect of deep cell parabolic luminaires, and is ideal for tight plenum areas, such as beneath duct work or structural beams. Designed specifically to refract light away from the 60 to 90-degree offending zone of a luminaire, the Flat Optix™ micro-prismatic lens delivers a Unified Glare Rating (UGR) of less than 19, indicating that most occupants of a space will not be disturbed by the uncomfortable glare that has become prevalent due to increases in product efficacy. Flat Optix™ is a revolutionary system that will enhance and redefine an occupant’s experience within modern interior spaces. The ability to drastically diffuse and redirect light is a key attribute that allows for softer, well-balanced illumination for office spaces, educational facilities, themed areas, & healthcare applications. Unified Glare Rating (UGR) is a dimensionless parameter, which provides information into the degree of psychological glare of a lighting installation in an indoor space. Deco’s Flat Optix™ technology is the optimal solution for redirecting high-angle light, and reducing visual glare. The light above 60° is redirected downward to improve the Unified Glare Rating (UGR). This allows for the luminaire to be IESNA RP1-04 & EN12464 compliant, which are standards for office and indoor lighting. With Flat Optix™ providing the most optimal, glare-free illumination from any viewing angle, occupants of the interior space will not be affected by the harsh glare that is delivered by high efficacy, low quality luminaires. Deco luminaires using Flat Optix™ allow a myriad of driver and control choices. Deco Lighting is in partnership with the companies below, and not only integrate their sensor and driver technologies into Deco Lighting luminaires, but also fully test the sensor/driver combinations before providing the systems to consumers.